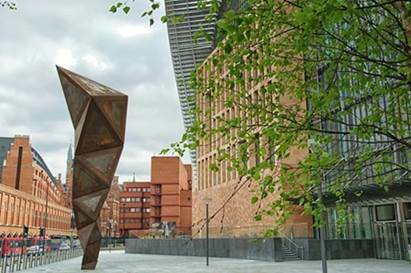 The British-Slovene Society has arranged a visit to the Francis Crick Institute in London, where world-leading gene research into DNA and RNA takes place. Our host will be Slovene researcher Jernej Ule, who will show us round and explain the work of the Crick. Subsequently, we can mingle over a drink in the bar on the ground floor, open to 6pm. Time: 6th June, 5.00 to 6.30 pm. Address: The Francis Crick Institute, 1 Midland Road, London NW1 1AT. See attached map. The entrance is opposite the Midland Road entrance to Eurostar, adjacent to the sculpture in the attached picture. This is a rare occasion to learn about some of the fundamental biology underlying health and disease from a qualified Slovene expert. Here’s a link to Jernej, our host: https://www.crick.ac.uk/research/a-z-researchers/researchers-t-u/jernej-ule/. This visit is exclusively for members of the British-Slovene Society. If you wish to become a member, you can do so on the website https://www.britishslovenesociety.org/ under JOIN/RENEW. For security reasons please apply beforehand to the email address: cjcking@gmail.com.